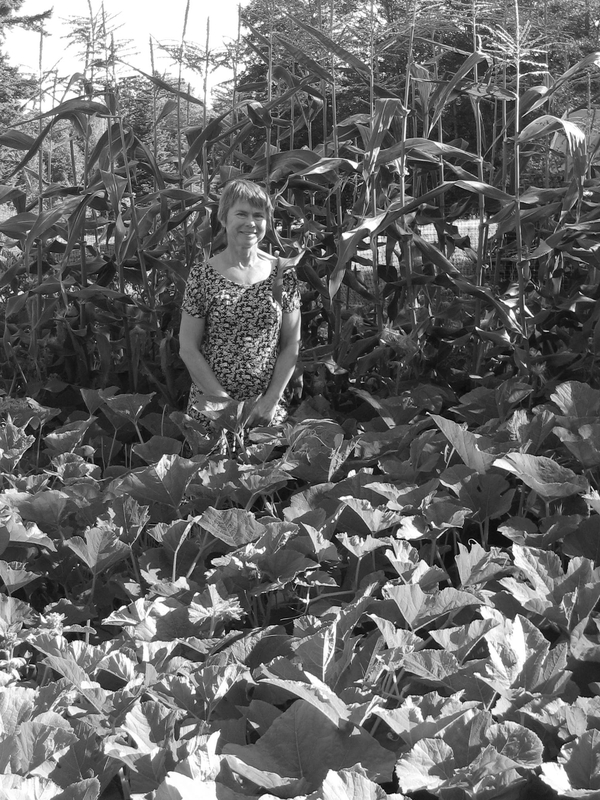 Even though it’s been 60 years since my Nanny’s garden was at its height, it still grows in my memory. I grew up on a farm in Skagit County, Washington, and my grandparents lived in the big farmhouse right next door. Behind the bunkhouse (a dark, decrepit place where garden tools, overwintering dahlias and begonias, and ghosts of farmworkers lived), was the vegetable garden. Two rows of raspberries grew nearest the fence to the west pasture, and in front of the raspberries was the magic place where corn and beans, lettuce and carrots, squash and tomatoes seemingly grew by the day during the summer. On the side of the bunkhouse were two large cherry trees, “his and hers”, where my brother and I spent many happy hours, with only pits being thrown back and forth, until Nanny came out of the house and saw us up too high for her comfort. Under the cherry trees, on a tall wooden fence meant to divide the yard from the farmyard and driveway, but be out of way of the high rope swing hanging from a sturdy branch, Nanny hung baskets of fuchsias. On the other side of the cherry tree fence, near the driveway, was the dahlia bed. Along the wagon wheel fence to the east pasture, a minefield of cowpies and dangerous young bulls that separated Nanny’s house from ours, were clumps of innocent irises, punctuated by red hot pokers. Rose bushes and other shrubs graced the beds closer to the house. On the northside porch, Nanny planted begonias in the planter boxes that she had built into the porch when they remodeled the old house. Closer to the road, Nanny persuaded Gramps to till up another section of grass for her cutting garden, a joy in late summer. In front of the house were two large hawthorn trees, whose blossoms were most welcome in midsummer when the other trees were done with their blossomy shows. And under the hawthorns, not visible from the road, were masses of pansies. It was the custom in our family that whoever was available around 3:30 pm for coffee time, the break from the afternoon farm chores, would be welcome at Nanny and Gramps’s place for coffee and cake or cookies. Unless there were guests, coffee time lasted only about 15 minutes, but it was a time to catch up with everyone’s day. It was also a great time for Nanny to enlist us children in some gardening “chores.” My personal favorite was picking the pansies. Nanny thought it was really important to keep the pansies picked so that they would keep blooming, and since she had become somewhat arthritic, getting down on the ground was not so simple anymore. She had a lot of pansies and a lot of pansy vases to keep filled. I can’t look in my vase cupboard without coming across some of these pansy vases, and, even though I don’t bother to pick pansies for the house, just looking at one of these vases is a happy memory for me. Now that I think about it, most of the children’s chores in Nanny’s garden involved harvesting of some sort. We were happy to help pick strawberries, raspberries, cherries, and anything else that could be munched right on the spot. I remember pulling out clumps of carrots and carefully wiping them off on my dirty jeans before taking a big, sweet, crunchy bite. I don’t remember doing any weeding at all. As a young adult renting my first house, one of the first things I did was to dig up a patch of lawn for a vegetable garden, and I’ve been a passionate gardener ever since. Now that I’m a grandmother, I see it as a calling from my heritage to try to pass on the love of plants and nature that my grandparents instilled in me. Over the last two years since I retired from a regular work life, I’ve tried to spend time in nature with my granddaughters, Isabella and Sophia. It’s fun to see how they respond to flowers, fruits, bugs, rodents, snakes, and birds in the yard and garden, and to crabs, fish, worms, and other forms of sea life at the beach. This year, turning eight, Isabella asked for a garden bed for a birthday present. By the time I learned of it, she had already decided what she would plant—carrots (the only vegetable on her favorite food list) and flowers. When I brought a collection of seeds over for her to choose from, she picked out the carrots, nasturtiums, alyssum, wildflowers, and (how did she know this would get to me?) pansies. I’ve started another blog to chronicle my experiences in nature with my granddaughters. Hope you’ll check it out! fun to read. Our daffodils looked a bit sad this morning under the weight of some fresh snow. But I figured that it would snow since it was bike/walk to school day for kids here in Whitefish. They all biked and walked anyways…..:). This is a lovely story. Your grandmother’s influence on you is apparent.